There is a large natural population of the little ladies around our property. 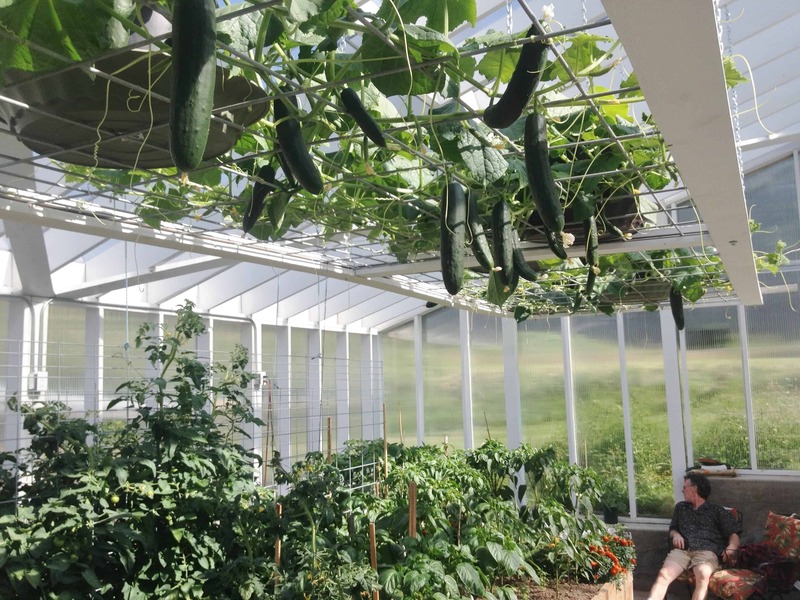 Here is a story from our first year of greenhouse gardening. Our peppers were infested with aphids from about 4 inches tall. We battled them and learned about organically controlling aphids. In that same year, Dave found this ladybug down by our mailbox. He very carefully put her on an envelope and drove up our bumpy, long driveway in his old red truck, to our greenhouse. She stuck with him and landed in ladybug paradise! Aphids were all over our peppers, petunias and basil plants in there. Ladybugs as Organic Pest Control. This little lady is about to lay her eggs. the next generation of ladybugs will get to work in a hurry! 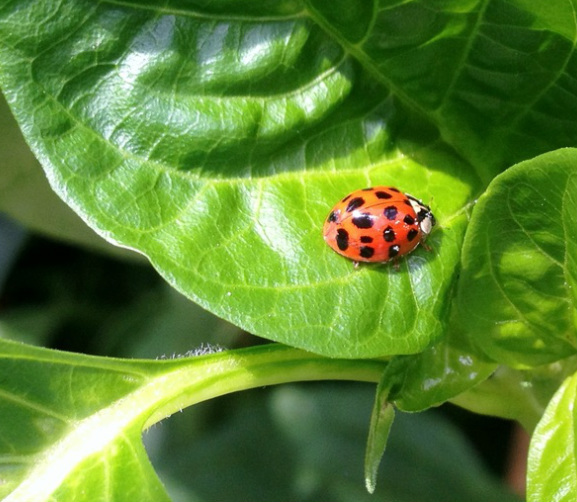 She had been out there for about a week, busily munching on the aphids that seem to thrive on our pepper plants. I spotted her in the mornings sunbathing on the pepper leaves. Then we found ladybug eggs on a large pepper leaf! Now I know what the sunbathing was all about. More ladybugs are on the way! I released another adult ladybug into the greenhouse a few days ago, but she is incognito at this point. Our ladybug friend was busy, busy, busy! She went right to work devouring aphids and laying her eggs. Good girl! Here is a video of ladybug eggs just hatching in our greenhouse. 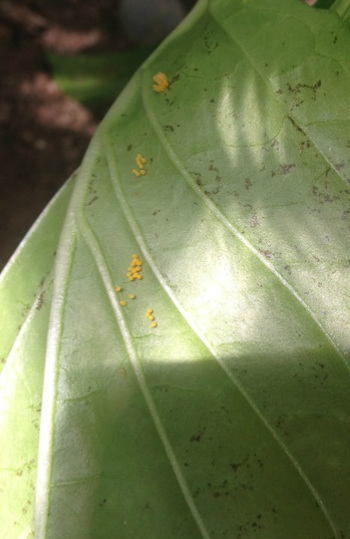 We found these eggs on the underside of our pepper plant leaves. We were fortunate to come upon this group of eggs hatching out. In the video, (linked Above), You can see the larvae, just hatched, already searching out prey. We have always had Asian ladybugs around our place. In fact, for about 15 years they were pests in our house. In the fall they came in by the thousands to live in cracks, crevices and our attic. They spend the winter hibernating with us: NOT our choice. We remodeled this old house about ten years ago and that drastically reduced our uninvited wintertime guests. Now we see them in the yard and outdoor garden. (a few still invite themselves into the house but it’s Much better!) We knew ladybugs prey on aphids and are a gardener’s friend. We would like to keep them out of the house and in our garden and greenhouse! Greenhouse in June 2014. Those peppers are FULL of aphids. Ladybugs, or lady beetles (Hippodamia convergens) are the best known garden predators available. They are known to help control aphids, mites and scale! ladybugs, both the adult and their dark gray and orange marked larvae, feed on aphids (40-50 per day) and a wide variety of other soft-bodied pests, mites and insect eggs. The University of Kentucky has a great fact sheet on ladybugs as predators you may find useful. We hadn’t seen any adults or larvae in our greenhouse in almost a week. Our poor basil was infested with aphids. I was pinching it back and spraying it with homemade insecticidal soap (recipe here). As I was going through the basil clippings I found two large ladybug larvae crawling around. Happy little things are just gorging themselves on aphids. We just don’t have enough ladybugs to keep up with the task. Once they eat down the aphid population they will move on to find prey elsewhere. The insecticidal soap is a very necessary component of our organic pest control this year. We are concerned about harming our ladybugs with the spray but this source says that ladybugs and other beneficials will do okay, even if sprayed with organic soap solutions. Please let me know how you control aphids and other pests in your greenhouse organically. I’d love to chat! Our ladybug’s eggs. 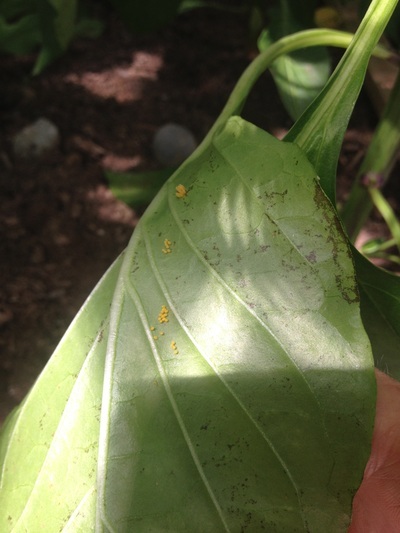 If you see these types of eggs on your plant leaves. Don’t smush them! they are your friends. And so are the creepy looking larvae that hatch out of them. Check out the videos in this post to see the larvae in action! This video will give a live visit with a much older ladybug larvae. The larger ladybug larvae looks nothing like the ladybug adults we relate to. Know your ladybug larvae. These larvae are our workhorses in the aphid battle. They eat a gazillion aphids before they pupate. The larvae will attach themselves to the underside of leaves in a chrysalis and eventually emerge as adult ladybugs. 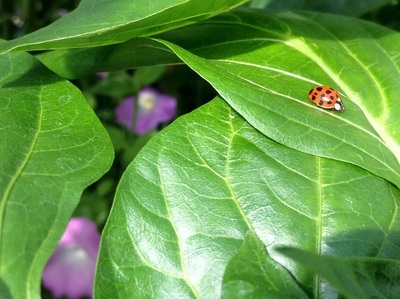 Ladybugs as Organic Pest Control works best if you can keep them in your garden! Provide a water source. Example is flat plates of water under your garden plants (not to much or mosquitos will flourish). Plant flowers they love. Some Ladybug species need flowering pollinating plants. Garden choices are chives, yarrow, alyssum, cosmos, cilantro, dill, feverfew…lots of choices! 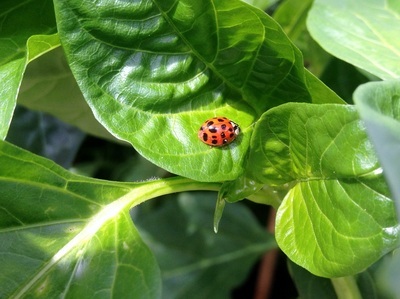 Plant decoy plants that actually attract and hold aphids to draw ladybugs into your garden. Marigolds and nasturtiums are aphid favorites. We grow both of these plants in the greenhouse. Aphids also LOVE basil! These all make great companion plants in your garden. And keep the ladybugs happy too! If you’d like to buy some beneficials. Planet Natural is a good resource for organic gardening information and products. Thank you Marc. I read your article and will share it on my social networks. Good topic! Wow, I had no idea that ladybugs can serve such a huge purpose. It definitely makes sense though, especially after the way you explained it. THanks so much for sharing! I found that spraying with 100% Cold pressed Neem oil works well to control Aphids. Thanks for the suggestion! You place looks lovely! We stopped by your site for a quick look.